This wedding was beautiful and flawless for so many reasons! The day (a perfect day with plenty of sunshine and temperatures in the 70s) began with the wedding party getting ready at The Jefferson Hotel. Followed by a classic ceremony at a historic, downtown church, the wedding party had photos taken at The Virginia State Capitol. Audrey Rose Photography did a fantastic job capturing this wonderful couple! The reception took place at The Commonwealth Club, truly making this an Iconic Richmond Wedding! Flowers Included, in shades of white and blush, Ranunculus, Hydrangea, Astrantia, Dahlias, Anemones, and were accented with a Taupe-y Purple Rose called Amnesia to highlight the bridesmaids’ dresses. Selene and Michael were married at the gorgeous Mt. Ida Farm near Charlottesville, Virginia. The day was rainy, but it didn’t stop the feeling of excitement and definitely love! 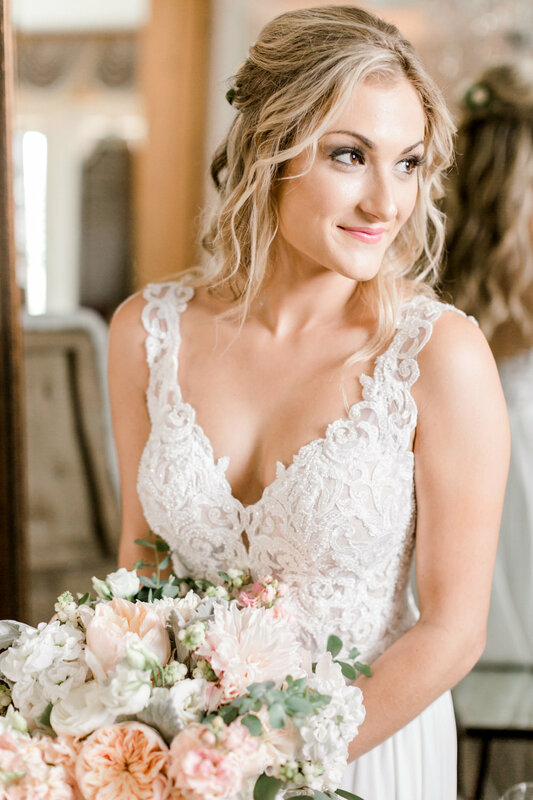 Selene was absolutely stunning in her gown, and we loved her flowers too! She chose sage green dresses for her bridesmaids dresses, so we used eucalyptus greens to accent that color. And then Selene decided to accent with a blush and peach tones, making everything so soft and romantic. Flowers Include: Juliet Garden Roses, Peach Stock, Sweet Eskimo Roses, Ranunculus, Lisianthus, Hydrangea and many more! Even with rain in the forecast, this day was perfect! The ceremony and reception took place at Upper Shirley Vineyards, and the backup rain tent wasn’t even utilized! Rebecca, a photographer herself, chose the talented Tanya with Tenth and Grace to capture the day. 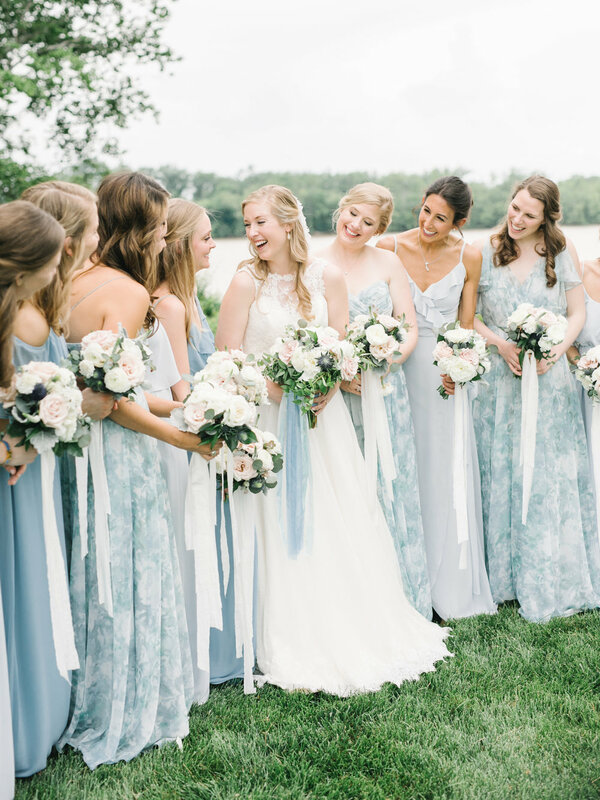 Flowers in shades of white, blush and sage complemented the dusty blue bridesmaids’ dresses. And natural wood-tones throughout the venue toned down the gold embellishments. This was truly a beautiful wedding! 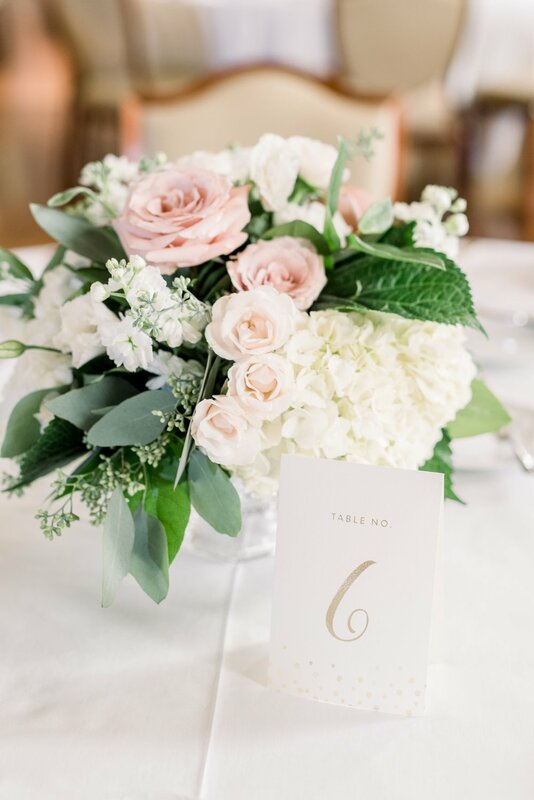 Flowers include: blush Sweet Eskimo Roses, white Veronica, Ranunculus, Stock, Scabiosa, a few blue Thistle, and various forms of Eucalyptus greens and Water Oak.